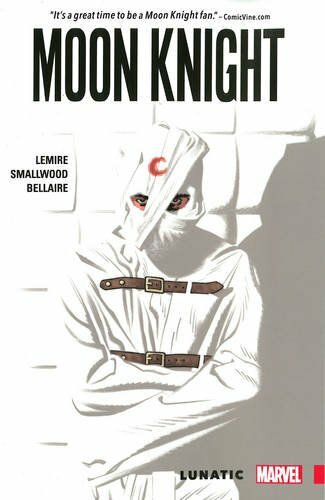 Long before Deadpool took crazy to a whole new level, Moon Knight was Marvel’s first hero with a few screws loose and a whole colony of bats flapping around his belfry. Raised from the dead by Egyptian God of the Moon, Khonshu (or Khonsu as he’s more commonly known) to be his Earthly avatar of vengeance, former mercenary Marc Spector became Moon Knight, the break bones first and ask questions later vigilante who criminals learned to fear and legions of fans came to love. Okay, maybe that’s overstating the case a little as Moon Knight has never exactly been at the forefront of the premiere league of costumed crusaders but that’s, I suspect, because he’s always been slightly ahead of the populist curve. See, Marc Spector’s story dealt with multiple personality disorder when mental illness was something that people didn’t talk about, when it was viewed as a stigma and not with the clarity and understanding that it is today; and despite the fact that he was in every other respect a bruising, no-nonsense all action hero, the struggle with his own psyche that lay at the books centre has always prevented Moon Knight finding the larger audience he so richly deserves. He is, in essence, a cult figure and like the best bands to which only a select few are privy, his fans are devoted to him in ways that most mainstream folks will never understand. And I count myself among the faithful, having been a fan since I picked up his debut issue way back before home computers were even a thing and gaming consoles had a wood finish. I’ve still got the book, and despite the fact that it’s beat to hell and worth next to nothing, it’s one of my most prized possessions because it’s Moon Knight’s first issue. I told you, us Moon Knight fans; we’re nothing if not dedicated. 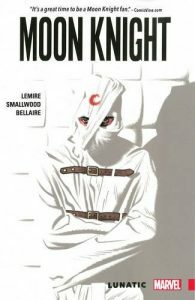 Jeff Lemire, just like all the best writers who have guided Spector’s journey – and that includes the incredible runs by Charlie Huston, Brian Michael Bendis, Doug Moench and Warren Ellis – gets Moon Knight. Or more specifically, he gets Marc Spector and his other selves, Jake Lockley and Steven Grant and knows exactly what makes each of them, and the individual behind them, tick. Lunatic finds our hero in what some would argue is the best place for him, an asylum. Locked up in an old fashioned hospital for the insane, Lemire’s story follows his attempts to ascertain which reality is the truth, the one in which he’s a masked crime fighter, or the one in which he’s a long term, institutionalised patient struggling with a dissociative condition. Surrounded by figures from his past, and still talking to Khonshu, Spector gives in to his demons, becomes Mr Knight and chooses to fight back against his persecutors in an effort to gain his, and his friends, freedom. Bursting with vivid, detailed characterisation and built around a gorgeously illustrated, complex, engrossing story that twists and turns its way through both Spector’s mind and the institution in which he’s trapped, Lunatic dances around the issue of what is, and isn’t real, snapping back and forth between the “realities” that it’s title character exists within.